Better Health starts here. Check out our upcoming wellness programs. 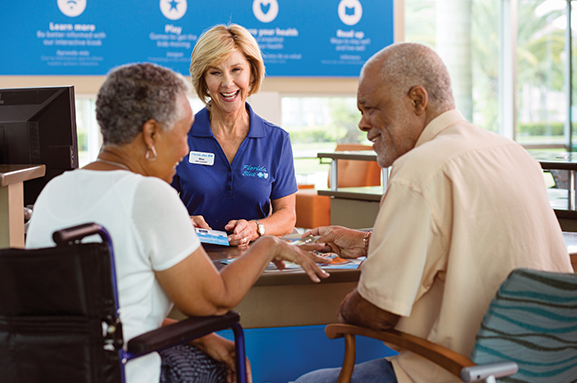 The Florida Blue Centers connect neighbors like you to services, support and advice that help you achieve better health. 1675 NW St. Lucie W Blvd. 15030 N Dale Mabry Hwy. It’s the place to go for inspiration, motivation and advice. We’re right in your neighborhood. Better health starts here. Our doors are open to all Floridians. So invite your friends and neighbors to join you here. We offer free fitness and education programs and events each month. Better health starts with YOU! Join a fitness program at your local center. If you got married, moved, changed jobs, or had another qualifying event you have 60 days to enroll. We know you’re looking for quality care at an affordable price. We can help you compare plans and find one that fits your budget and lifestyle. Whether you are purchasing your first health plan or perhaps seeking a new plan to include your new family members, we can help you find the right option. Need to understand the basics of insurance or the details and opportunities of the Affordable Care Act? Ask Us! We’ll introduce you to a variety of personalized, self-paced health improvement programs designed to inspire and reinforce a positive behavior change. From weight and stress management to diabetes prevention and nutrition, we have ongoing wellness activities all during the year. Be sure to visit often to check out the newest wellness programs offered by our certified health coaches at your Florida Blue Center. Do you have a health condition that will require some lifestyle adjustments? Or do you need a little support managing an existing condition—such as diabetes or asthma? Talk privately with a nurse about your condition and get the information and support you need all along the way. We’ll help you understand how to follow your doctor’s treatment plan, and answer any questions you may have as you learn to manage your condition. Get a snapshot of your current health. And we’ll help you with a plan to make it better. Members can stop by or make an appointment with a nurse to get a Personal Health Assessment. It’s quick—easy, confidential and no additional cost to you. You’ll receive a full-personalized report, including screenings for: cholesterol and blood glucose, blood pressure, height, weight and BMI. See what activities are being offered at your local center. We’ll show you the latest Tai Chi moves, or how to strengthen your core for better back health. You can join a free Yoga, Zumba or exercise class. We offer something for everyone. Nutrition advice is open to the community through ongoing classes, and presentations. We’ll help you learn about good nutrition during pregnancy, healthy grocery shopping on a budget, learning to count macros, portion control, and more. Our health coaches can give you sound advice about your eating habits and how to improve them. We’ll show you the latest apps and devices to help you track your health and fitness goals. 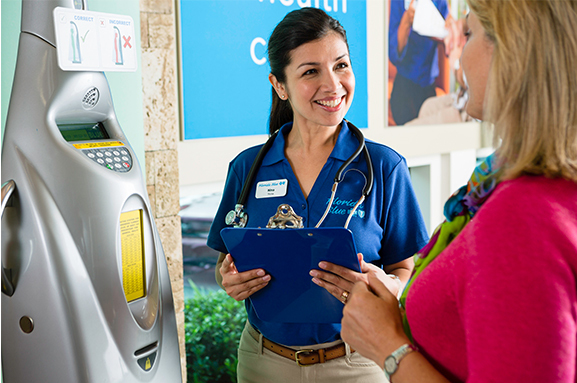 At select Florida Blue Centers, you can try out the latest health and wellness apps and devices before you buy them. See demos on apps that provide timely health, medical news and information, or a complete source of drug information and access to world-renowned medical expertise. We’ll introduce you to a variety of personalized, self-paced health improvement programs designed to inspire and reinforce a positive behavior change. From weight and stress management to diabetes prevention and nutrition, we have ongoing wellness activities all during the year.. Be sure to visit often to check out the newest wellness programs offered by our certified health coaches at your Florida Blue Center. We’ll show you the latest apps and devices to help you track your health and fitness goals. At select Florida Blue Centers, you can try out the latest health and wellness apps and devices before you buy them. See demos on apps that provide; Timely health, medical news and information, or a complete source of drug information and access to world-renowned medical expertise. There’s always something happening at your local Florida Blue Center. Sign up to find out the latest updates to the Florida Blue calendar of events. From health fairs, weekly wellness programs to special guest seminars, take advantage of these free events for you and your family. You can even bring a friend! These policies have limitations and exclusions. The amount of benefits provided depends on the plan selected and the premium may vary with the amount of benefits selected.